A scarce 1755 map of the eastern part of North America by Georges-Louis Le Rouge. 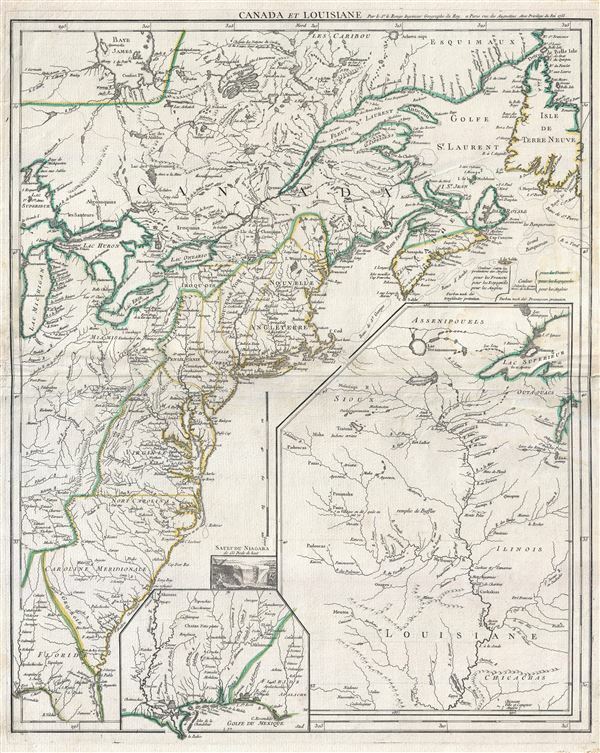 This important map was issued in the second year of the French and Indian War. Centered on the British colonies in North America, the main map covers from Lake Michigan (Chicago) to the eastern seaboard and from James Bay (Hudson Bay) to the Gulf of Mexico. Large insets further extend the map westward to cover the Upper Mississippi River Valley, the Lower Mississippi Valley, and the Gulf Coast in the vicinity of New Orleans. Spanish territory is identified in green, French in blue, and English in yellow. Le Rouge issued this influential and popular map in the early days of the French and Indian War when the French, having won every major battle, seemed assured of victory. The map reflects an idealized and Franco-centric perspective on the region, with the British colonies restricted to the eastern flanks of Appalachian Mountains, and the southern parts of Nova Scotia and Newfoundland. All five of the Great Lakes as well as the important St. Lawrence and Lake Champlain arteries fall well into French territory. The site of the Braddock's disastrous attack on Fort Duquesne is identified as is the site of George Washington's primitive construction of Fort Necessity. Curiously the cartographer seems unsure of the location of Fort Duquesne and places it twice: a northerly site following the French cartographer J. B. B. D'Anville, and a more southerly site referencing the British cartographer Thomas Jefferys. On Lake George, the cartographer notes the 1755 Battle of Crown Point, a failed attempt by British officer William Johnson to seize Fort. St. Frederic and thus set the stage to undermine French control of Canada. The maps' two insets focus on French territory in Louisiana from New Orleans to the Upper Mississippi Valley. Numerous French fortifications are identified throughout and though most of these were little more than fur trading outposts, their presence on the map is intended to reinforce the impression of French control and occupation. So too is the liberal identification of various indigenous American Indian groups and mineral deposits throughout, a clear indicator in the eyes of the European citizenry of national hegemony throughout a territory. A vignette set just off the Carolina Outer Banks illustrates Niagara Falls, then a remote wonder popular with European mapmakers and a curiosity for the general public. Also of note is the uncommon vertically oriented mileage scale presented just above the Niagara vignette. The present example represents this map in its first edition, 1755. In 1777 it was subsequently reworked to accommodate the nascent United States and retitled it Theatre de la guerre en Amerique. It was revised again in 1787 shortly after the finish of the American Revolutionary War. Good. Minor wear along original fold line. Extremely minor water satin, almost invisible.